Hōitsu is more commonly associated with his key role in the revival of the decorative Rinpa school founded by Ogata Kōrin (1658-1716) than with the formal genre of Zen religious portraiture (‘chinsō’). Yet from his youth he explored a variety of painting styles. He was born into a powerful clan family and was able to pursue his artistic interests freely, including the study of Kano school artists, the Ukiyo-e manner of Kitagawa Utamaro (1753?-1806) and Nagasaki bird-and-flower painting (1). Following the death of his brother in 1797, Hōitsu took Buddhist vows in the Pure Land sect and spent the rest of his life painting and promoting the Rinpa style in Edo. Abbot Zetsugai was the 241st abbot of the eminent Myōshin Temple established in Kyoto in the fourteenth century. He is depicted, according to ‘chinsō’ conventions, in three-quarter view, wearing his ecclesiastical mantle (‘kesa’) and seated cross-legged on an abbot’s throne. He holds in his hand a white fly whisk (‘hossu’), which protected Śakyamuni Buddha at his birth and symbolised the ability of the teacher to remove obstacles to the student’s enlightenment (2). 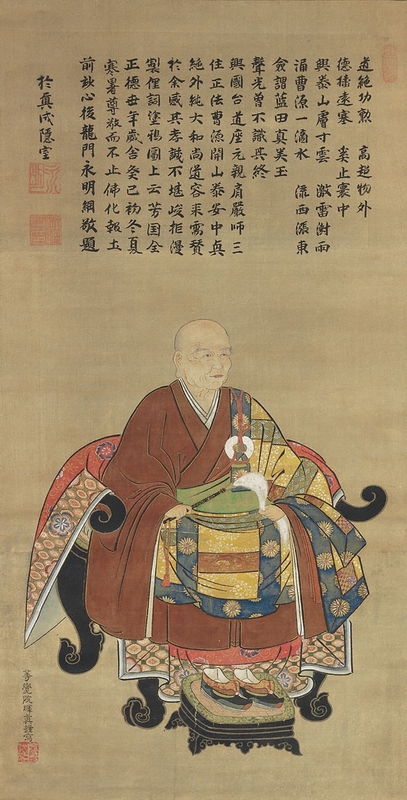 Abbot Zetsugai died in 1713, so it is likely Hōitsu painted this depiction to replace a damaged original. The signature and seal suggest it was completed when Hōitsu was aged between forty-one and forty-four (3). Surely far beyond this land. Gushing flows to the west, surging tides to the east. (1) McKelway (in Singer et.al. 1998, p.357). (2) Saunders (1960), p. 152). (3) Menzies (ed.) (2003a, p.195). (4) Levine (2005, p.319 n). (5) Faure (1991, p.175 n). (6) Both verse and postscript translated by Songping Jin, University of Adelaide. James Bennett, ‘Portrait of Abbot Zetsugai’ in James Bennett and Amy Reigle Newland (eds. ), ‘The golden journey: Japanese art from Australian collections’, Art Gallery of South Australia, 2009, p. 64-65. Signed l.l., in Japanese, ink [inscribed] "Tôkakuin Kishin kinsha" [and artist's seal]. Not dated. Signed u.l., in Japanese, ink [inscribed] "[calligrapher's signature and two seals]". Not dated.